Stand Back! I’m going to try SCIENCE! Today I discovered that my favorite webcomic (xkcd.com) actually has a special comic up if you check it from my employer’s server. Turns out the artist’s wife is a patient, doing well, and he wanted to show some love. This post is thus titled for this shirt, which would make an awesome Christmas present for me, even in April. Anyway, this weekend I saw this story with the headline “Study: Conservatives’ Trust In Science At Record Low”. My first thought on seeing this was that the word “science” is a loaded word. I mean, I’m as much a science geek as anyone. Math’s my favorite, but science will always be a close second. But do I trust science? I’m not sure. Something really bothered me about that question, but I couldn’t quite put my finger on it until I read this post on the study from First Things today. My love of science makes me a skeptic. I makes me question relentlessly and then continuously revisit to figure what got left out. I don’t trust science because not trusting your assumptions is science done right. If we could all trust our assumptions, what would we need science for? This is the problem with vague questions and loaded words. Much like the discussion in the comments section of this post where several commenters weighed in on the word “delegate” in relation to household tasks, it’s clear that people will interpret the phrase “trust science” in many different ways. Some might say it means the scientific method, scientists, science as a career, science’s role in the world, or something else not springing to mind. Given the vagueness of the question though, I would have a hard time actually calling anyone’s interpretation wrong. Mine is based on my own bias, but I would wager everyone’s is. So isn’t this survey more about how we’re defining a phrase than about anything else? I thought my annoyance was going to end there, I really did. Then I looked at the graph with the story, and had no choice but to get annoyed all over again. That’s what I get for just reading headlines. 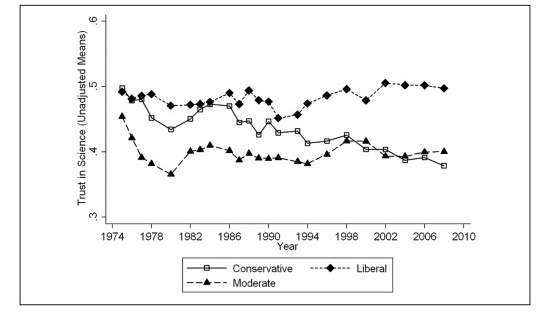 So over the course of this survey, moderates have consistently trusted science less than conservatives for all but four data points? Why didn’t this get mentioned? I found the original study and took a quick look for the breakdown: 34% self identified as conservative, 39% as moderate, and 27% as liberal. So 73% of the population has shown a significant drop off in “trust of science” and yet they’re somehow portrayed as the outliers? Science and technology have changed almost unimaginably since 1974, and yet liberal’s opinions about all that haven’t changed*? Does that strike anyone else as the more salient feature here? *Technically this may not be true. I don’t know what the self identified proportions were in 1974, so it could be a self-identification shift. Still. This might be that media bias everyone’s always talking about. Not the same thing as trusting science, I note. Also, the word “community” may be confounding, as we have a different response to that over time. The first few pages of the article seem to be a hand-wringing over “how can we get people to believe what we tell them? What's wrong with them?” As all of us would be hard-pressed to demonstrate plate tectonics, evolution, or germ theory operating on our own, much of knowledge about anything is deeply related to who one believes. If Kansas does not believe who we tell them to, then there is something the matter with it. And especially, our cultural hegemony is threatened. Nice catch. Annoyed that was buried 7 pages in. I think the snobbery is annoying to me in part because I've encountered too many liberal English majors who stick up their noses at the conservative business majors as though they are so much more educated in these things. I think both healthcare (other than social services) and engineering skew heavily pragmatic, which keeps people off the fringes. Put another way, in at least my branch of science, I don't see a liberal bias (even in Massachusetts), so I'm weirded out it's getting co-opted like that. Also, I really think it's important what kind of science. People may not buy climate science, but you don't see many turning down the latest cancer treatments (or at least not out of proportion to efficacy). The article mentioning the survey is clearly trying to make the point that “science” or “scientific community” is becoming politicized and conservatives are the head-in-the-sand group who won't believe in “settled science”. Hasn't science developed ipods, ipads, roku, access to internet from almost anywhere possible? What's not to trust? Or are we talking about nutrition studies that come to different conclusions every few years (eggs bad, eggs good?) I think your healthy dose of skepticism is appropriate and the correct approach. I think it's valid however, to ponder if science and technology should be conflated in this case. To me, science is observational and figuring out how things that already exist work, then applying what we know. Technology is more innovation…bringing to life a vision where nothing existed before. I would consider those different enough to keep them separate, and I could see how someone could distrust science without distrusting technology. Why would any sane thinking person having been around the last three decades trust the scientific community entirely? Think of all the “isms” that have been pushed in journalism about science AND enforced in the academy. In the 1980s an erstwhile undergrad professor of one of my brother's was doing groundbreaking work using then-innovative imaging to analyze and describe he differences between how female brains work and male brains work. The work was unpublishable for decades, nor could it be funded. Heck, it could hardly be admitted. All that “gender as a social construct” stuff, all the fads about healthy sexuality, the numerous “yer gonna die” scares, the wacky nutritional theories, even some of the climate stuff – have they WORKED? Or is it rather that they haven't proven out, and that the average person can tell that much of what he or she hears about the “scientific community” is politicized science, not knowledge-based science? It's become clear that if there is money to be given out for research supporting a particular popular cultural meme, some among the scientific community will leap upon it cries of joy and swear that black is white. Isn't this odd? To the extent that an individual really cared about scientific methodology, wouldn't the gradual development of the pseudo-public-scientism in the United States cause deep concern? We're not THAT far on these issues that become social flashpoints from Sovietization of science, or the Nazi's attempt to eradicate Jewish medicine and Jewish physics from their culture. The virtues of science lie solely in scientific method, and once you abandon scientific method, with its standards of plausibility, reproducibility, and skepticism the scientific community just becomes a type of public priesthood which is basically directed by money. Pure money. And worse yet, now we have the modelization of science, so that if we can make a plausible case (sometimes to any degree), and the hypothesis has cultural virtue, the scientific community will make that the public consensus. Think of the “out of Africa” bit about human evolution. It was never more than plausible based on the genetics, and since then it took over and persists even though the genetics probably have disproved it. But politically and culturally it is a necessary belief, so now it is the “truth”. Science can either be a skeptical, evidence-based discipline or it can be a cultural controller, but it is apparent that it cannot be both, because we humans are too flawed.